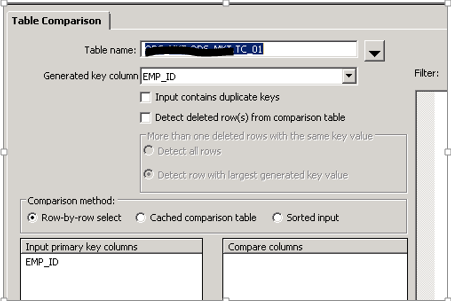 Adding further concepts to my knowledge I was working on Generated Key column of Table Comparison, placing the common column existing in both source and target and incoming source has duplicates. So below is my observation please have a glimpse of it! 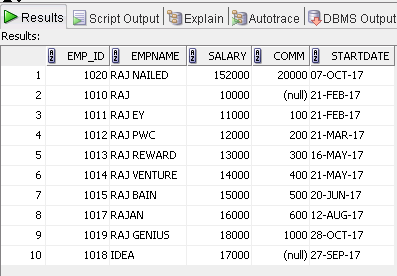 When records coming from source has duplicates for column(s) defined in Input Primary Key Columns section and out of those columns one is selected in Generated key column then records inserted in target are random. So in brief I’ve selected the column which is present in both source and target. Here it’s EMP_ID. How table comparison sends the records to the final target when this option is selected? Initially my target table has data present in it. When job is executed then this transform brings the rows to it’s before image for processing and then comparison starts. Based on the OPCODES generated the rows are sent to final target table. When the job is executed table comparison brings the records in it’s before image. 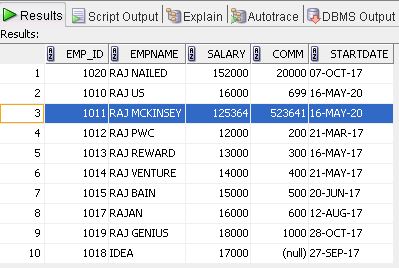 Initially target table has existing records for EMP_ID 1010 (1010, RAJ WRITER,..) and 1011 (1011, RAJ MCKINSEY,…). Now records coming from source are compared one by one. 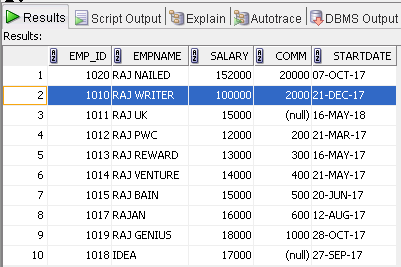 Firstly EMP_ID 1010 (1010, RAJ WRITER,..) is compared with existing id, 1010, RAJ WRITER,.., table comparison finds no change/update, hence no opcode is generated. 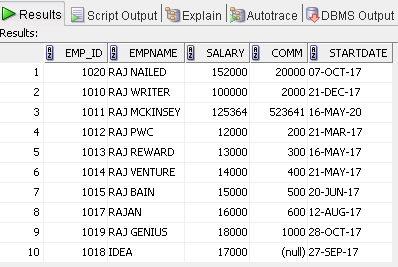 Then incoming EMP_ID 1011 is compared with existing id, 1011, RAJ MCKINSEY,…, and again no opcode is generated. 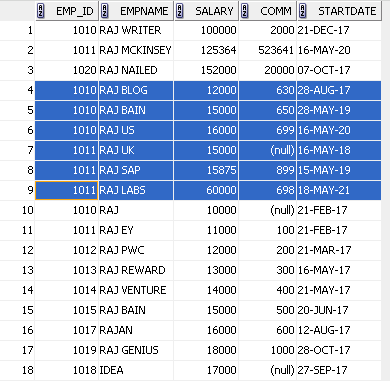 Now when EMP_ID 1010 (1010, RAJ,… ) comes from source its compared with existing id, 1010, RAJ WRITER,.., Table comparison detects that EMPNAME has been changed from RAJ WRITER to RAJ, hence it sends an update, ’U’, opcode. Similar is the case with EMPNAME RAJ EY for EMP_ID 1011. This was the case when we had only one duplicate record coming from source. Now let’s suppose that I add few more duplicates in my source for the EMP_ID’s which are present in target. Then how table comparison works, let’s see. Now which record will be sent by our before image to the target? For EMP_ID 1010, 4th record, with EMP_ID 1010, is sent to target table and for EMP_ID 1011 1st record, with EMP_ID 1011, is sent as displayed in above screenshot. As per above observation it should send 4th update for EMP_ID 1010 and 1st update for EMP_ID 1011, right? This time table comparison sent 1st update for EMP_ID 1010 and 1st update for EMP_ID 1011. Now again if you’ll run the same job then again it’ll give different outputs and different records will be sent to target. 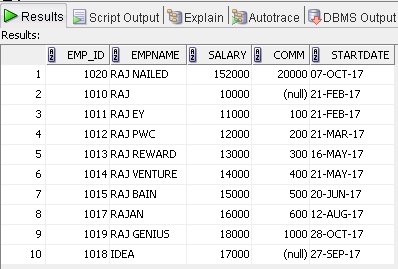 So this means if you use same column, present in source and target and column defined in Input Primary Key column has duplicate incoming rows, in Generated Key Column section then table comparison will randomly send the updated records to the target table. 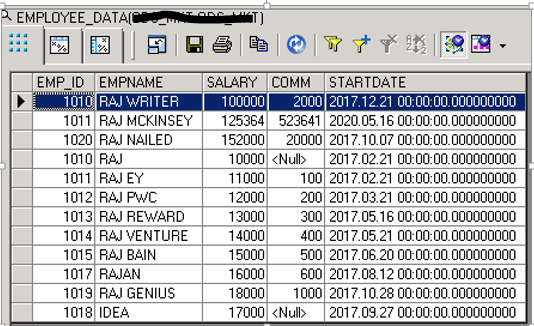 So if the column(s) specified in Input Primary Key columns section has duplicate incoming records and out of them if same column is selected in Generated Key column then table comparison will arbitrarily send the records to the target. Please let me know if I’ve missed anything or something is incorrect.